Online Approval allows individuals to submit Time2Track activities for approval electronically. Supervisors can sign off on hours electronically through Time2Track, which cuts out the need for paper copies and physical signatures. 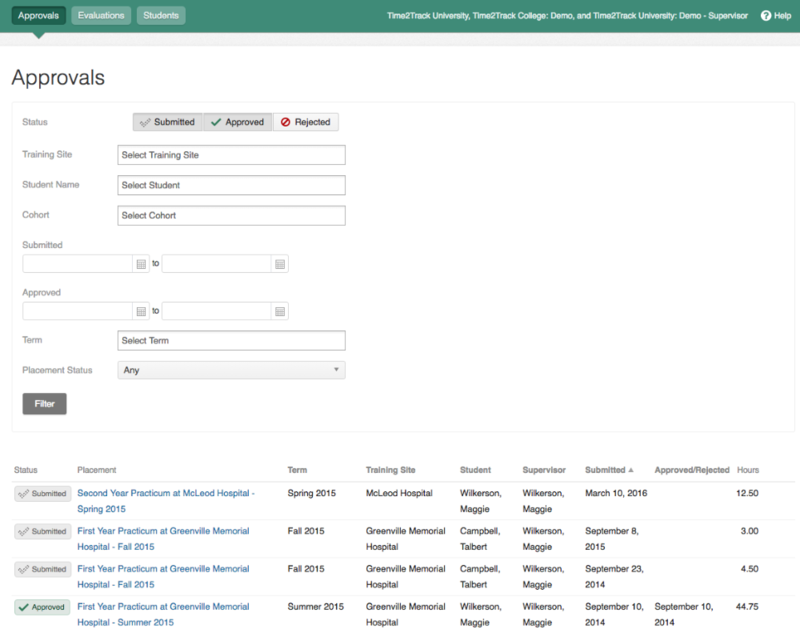 The entire process is tracked in Time2Track so institutional administrators can stay on top of the status. 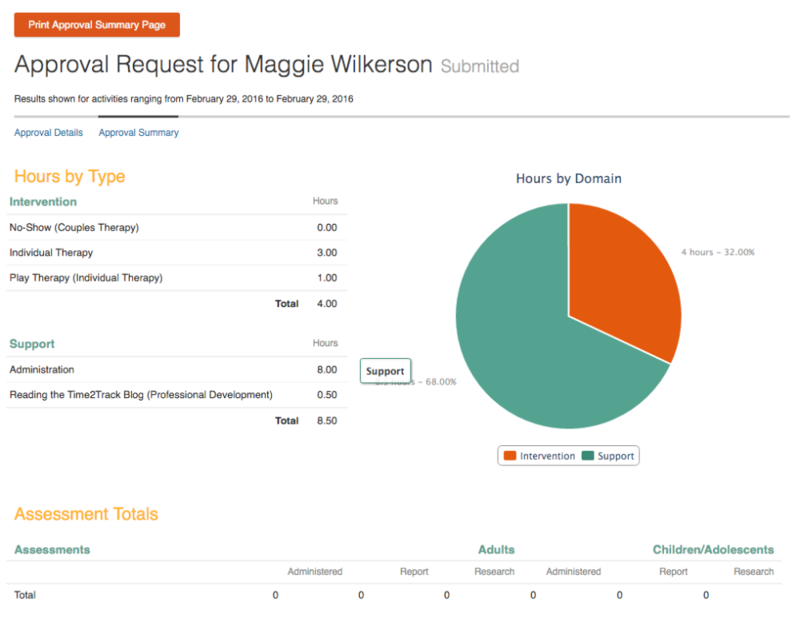 Online Approval is currently only available to Time2Track Institutional users, their trainees, and their associated supervisors. If you are interested in using Online Approval, please contact us. Approving a trainee's hours through Time2Track is quick, easy, and free. First of all, to use Time2Track as a supervisor, you'll need to be invited by an institution, school, or program. 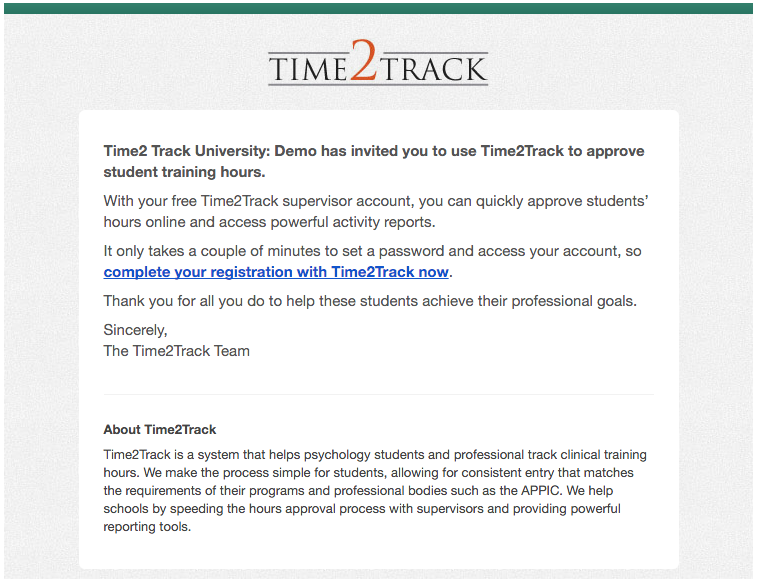 When a program invites you to use Time2Track to approve their students' hours, you will receive an invitation to setup your Time2Track account. All you'll need to do is click on the link in your invitation email, then fill in your information and set a password. License Number - has changed to Qualification ID. This could be a license number, certification ID, etc. If this does not apply, enter "N/A". State of Licensure - has been changed to State/Province of Qualification. If your qualification is designated for a specific state/province, include that information here. If this does not apply, enter "N/A". Now, when students have hours to submit for your approval, you'll receive an email notification. You can then log into your Time2Track account to approve the hours electronically without having to sign physical reports. You won't see any trainees in your Time2Track account until they submit approval requests to you. Approving student hours through Time2Track is quick, easy, and free. 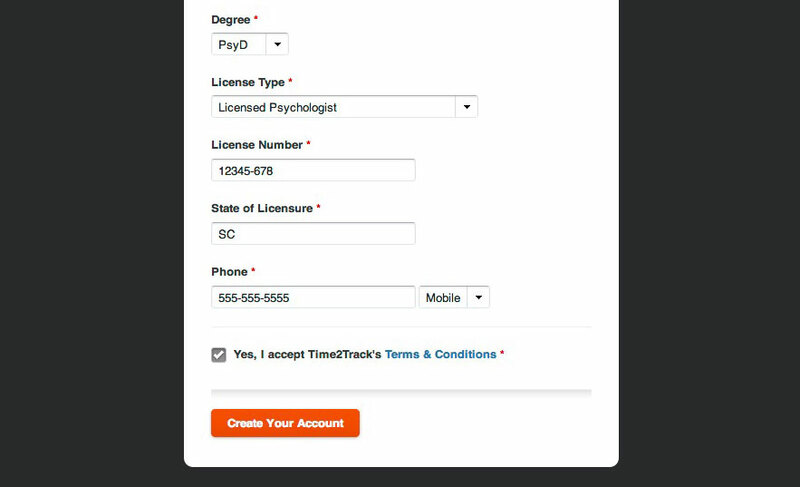 Once you've set up your Time2Track account, log into your account here. Next, you will see a list of all your Approval Requests sent to you by students. You can filter this list using the options at the top of your screen. 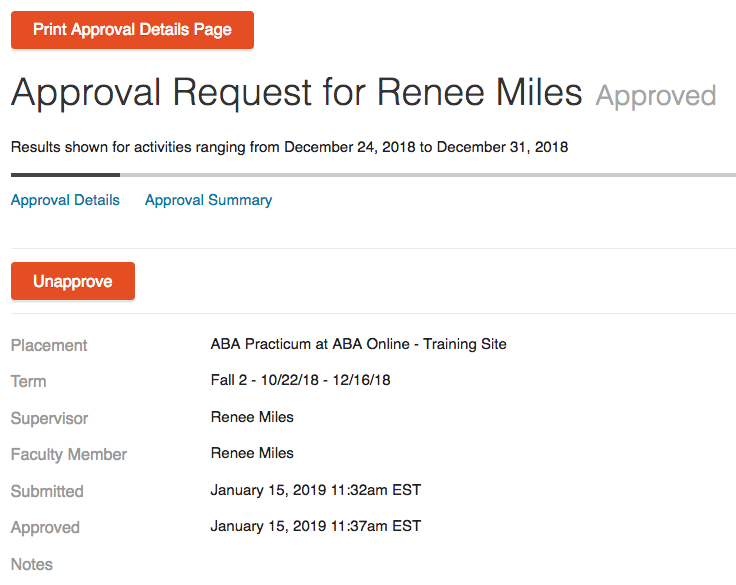 An approval request is like a timesheet – it contains a group of activities and their details. Trainees can send requests at any time and you can review them on your own time. From your list in the Approvals tab, click the name of a placement. Here, you will see the activity details of this trainee's approval request. You can also view a summary of the approval request details by clicking Approval Summary. After reviewing the details for accuracy, you can choose to approve the request or reject it. To approve a request, click Approve. To reject it, click Reject and add a comment explaining why you rejected it and what the trainee should do to correct it. The can then resubmit the request after making the appropriate changes. You can log into your account at any time and view all of your submitted, approved, and rejected approval requests. You'll also receive email notifications when an approval request is submitted to you. As a supervisor, you have the ability to unapprove a trainee's hours. Follow the steps below to unapprove hours that have been approved. Click on the Approvals tab at the top of the screen. 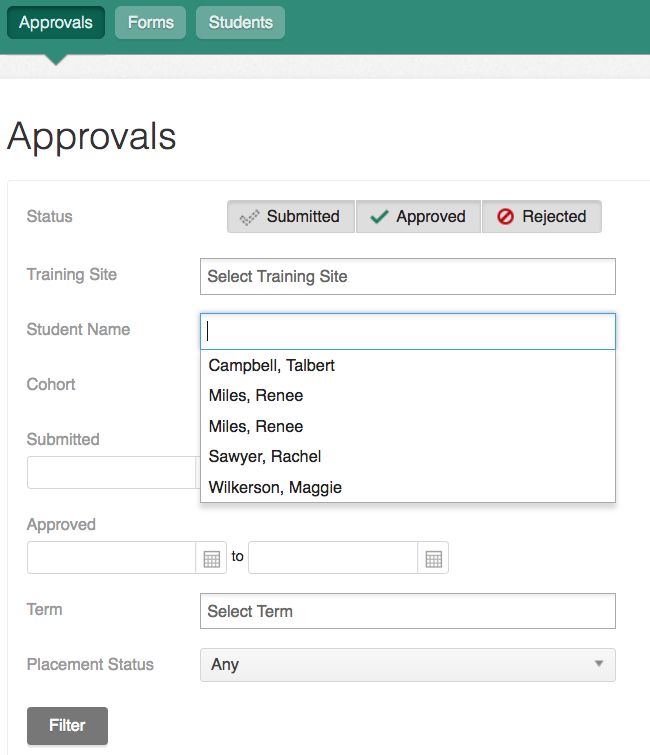 Enter the name of the student that needs hours unapproved and select the name when it appears in the dropdown menu then click Filter. A list of approval requests will be displayed for the student. Select the request that needs to be unapproved. When the details of the request are displayed you'll have the option to Unapprove the hours in that request. 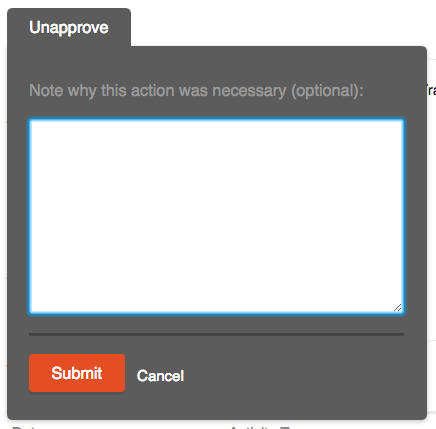 When " Unapprove" is clicked, you'll have the option to enter a note in the blank that appears. If you choose not to enter anything, click "Submit". Follow steps 3-5 for all approval requests that need to have hours unapproved. 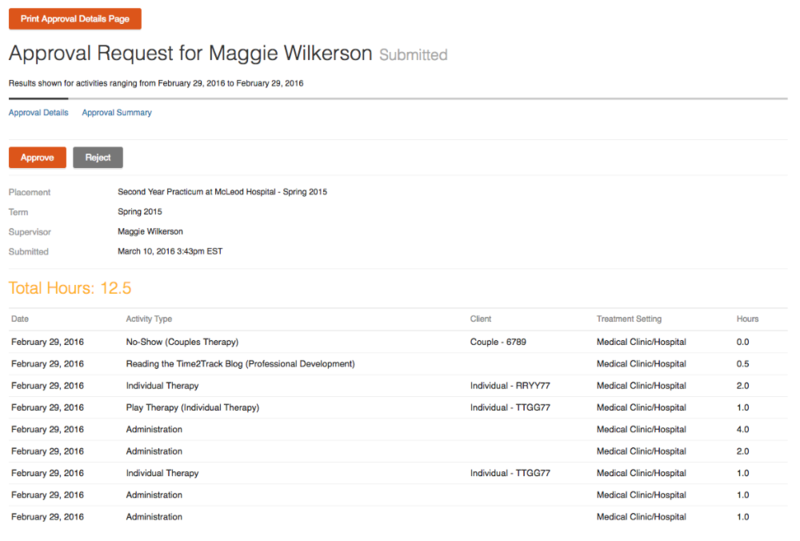 If your trainee's school or organization is using Online Forms, you have the ability to complete and sign evaluations and other forms through Time2Track that are sent to you by your trainee's organization. When a form or evaluation is sent to you to complete, you will receive an alert email from Time2Track letting you know. You can click the link in that email to be taken directly to your Time2Track account, or you can log into your Time2Track account here and click the Forms tab to access your forms and evaluations. To complete a form or evaluation, click Start Form . Fill out the correct information on the form (some information might be automatically populated for you), then click Save or Submit Form. Clicking Save will save your information so you can come back and complete the rest of the form later. Clicking Submit Form will send the form to your trainee for their review or directly to their program, depending on the form. If you are unsure whether your form will be sent to your trainee or not, check with your trainee or their program to verify. You can log into your account at any time and view all of your new and submitted forms and evaluations. You'll also receive email notifications when a form or evaluation is submitted to you, so make sure you add Time2Track to your safe senders list. Some forms and evaluations in Time2Track are completed by your trainee, but also require your review and signature. When your trainee completes and submits one of these forms, you will receive an alert email from Time2Track letting you know. You can click the link in that email to be taken directly to your Time2Track account, or you can log into your Time2Track account here and click the Forms tab to access your forms and evaluations. Click the link beside the form or evaluation that needs your review, review the information (the fields your trainee completed will be read-only), then complete any fields that are open to you (they won't be grayed out). When you're done, click Submit Form. The form or evaluation will then be sent to your trainee's program. Sometimes you may have the need to edit a form or evaluation that you've already submitted. In these cases, you can choose to unsubmit the evaluation, make your changes, then submit it again. To unsubmit and edit a form or evaluation, click Forms in your Time2Track account, then click View Form beside the form you'd like to edit. Click Unsubmit and Edit at the bottom of the screen, make your changes, then click Submit Form. 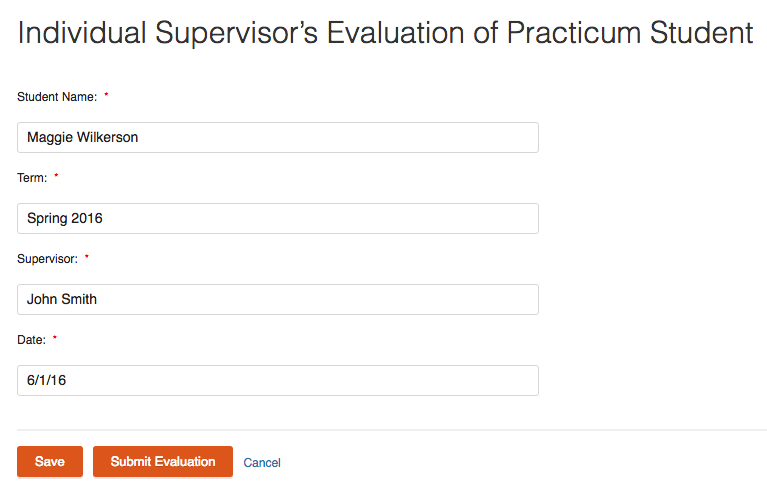 This will send the form to your supervisor for their review or directly to your program, depending on the form. 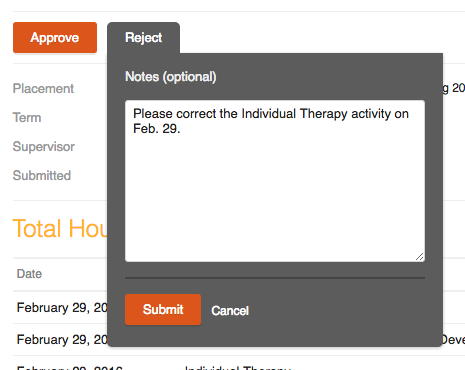 If you are unsure whether your form will be sent to your supervisor or not, check with your program to verify. Forms that have been approved by your trainee's program can't be edited. If you need to edit a form with an Approved status, contact your trainee's program to have them unapprove it. This will unlock the form and allow you to follow the steps above.